Sutzkever’s poem “To a Friend” follows the story of the medieval halakhic commentary Or Zarua, which was written in the late 12th century by Isaac ben Moses of Vienna; a copy now resides in the Bibliotheca Rosenthaliana in Amsterdam. Legend has it that this manuscript version of Or Zarua—one of only two in the world—was stuck underwater for several centuries after a ship transporting it capsized. Miraculously, in the mid-19th century, a fisherman in Holland pulled it from the depths relatively unharmed—albeit with shells encrusted on some of its pages. For Sutzkever, this difficult road from creation to exhibition does not diminish the piece but rather enhances and almost sanctifies it. He consoles Isaac ben Moses (the titular friend), calling him the “first Gaon of the depths”—a genius whose work survived even in the abyss. The manuscript “glows” and “shimmers”—a possible reference to Psalms 97:11, from which the poem gets its name: “Light is sown [Or Zarua] for the righteous . . .”—demonstrating that its existence could not be repressed forever. Or Zarua itself contains a rich description of Jewish life and customs in the Middle Ages; everyday experience preserved against all odds. Perhaps Sutzkever imagined that the world of Eastern European Jewry that he knew so intimately would someday be similarly transmitted through space and time. Synagogue door, where their sanctity fades. Along with your best friend—the manuscript. Only there does the climber feel joy. All rags and tatters, disappeared from a ship. The parchment starts to stir. And the pages probe the murky depths. Onto the coast of Holland! And for no small sum. And pearls, pearls on top of each like crowns. I saw the pearls above the letters . . .
See, my friend, eternity can bring rewards. צוזאַמען מיט זײַן װעלקנדיקער שכינה. באַנאַנד מיט דײַנע בוזעמפֿרײַנד — כּתבֿ־ידן. אַלײן אין תּהום, װעט ליב זײַן דאָס געקלעטער. אַנטרונען אױף אַ שיף אַ ייִד פֿון בעמען. און בלױז די בלעטער פֿון זײַן "אור זרוע"
"מיט מאַן און מױז די ספֿינה איז געזונקען." באַװעגן זיך די פּאַרמעטענע בלעטער. זאָנדירן זײ דעם גליװערדיקן דנאָלאַנד. האָט אױסגעקױפֿט שױן עמעץ זײַנע שולדן. און פּערל, פּערל איבער זײ װי קרױנען. אַזױ, מײַן פֿרײַנד, קען אײביקײט באַלױנען. *דער כּתב־יד פֿונעם 'אור זרוע', געשריבן אױף פּאַרמעט פֿון ר' יצחק בן משה, געפֿינט זיך אין דער ראָזענטאַליאַנאַ, אַמסטערדאַם. AVROM SUTZKEVER (1913–2010) is considered the premier master of Yiddish poetry. Born in Smorgon, he spent his early childhood in Siberia, to which his family fled during the First World War. He achieved renown as a writer in Vilna in the interwar period, making his reputation in the 1930s as part of the literary group Yung-Vilne, and he later survived the Vilna Ghetto. While much of his early work typifies the interwar Yiddish modernist movement, exalting the beauty of nature, his work spans the entirety of late-20th-century Jewish history, and the Holocaust and its narratives gave rise to much of his poetic landscape. After World War II, Sutzkever immigrated to Tel Aviv, where he spearheaded the literary journal Di goldene keyt (The Golden Chain), a self-conscious attempt to connect with the rich Yiddish literary tradition of Eastern Europe and continue its legacy in Israel. JAMES NADEL is currently a Fulbright Scholar living and teaching in Baku, Azerbaijan. His research focuses on the history of Yiddish-speaking communities in Eastern Europe and Eurasia. Nadel was a 2017 translation fellow at the Yiddish Book Center. 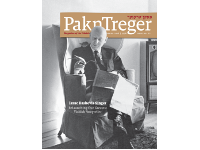 Previously, his translations of Sutzkever have been published in In geveb and The Paper Brigade.